Time for another lesson with the English teacher! 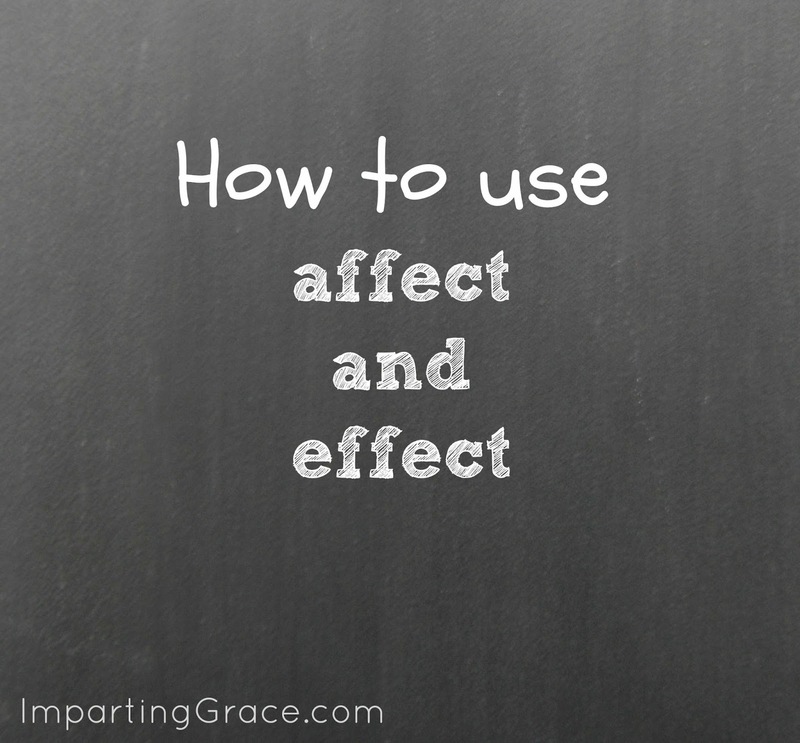 Q: When should I use the word "affect" and when should I use "effect"? That's a great question. These two words sound so much alike that they cause a good deal of confusion for writers. Like so many issues I'll address in this series, the words are no problem when spoken; only when written are they troublesome. First let me explain that these two little words both have primary and secondary uses. First we'll talk about their primary uses. If you can get this usage right, you'll be on target with these words 9 times out of 10. Affect is a primarily used as a verb that means "to act upon" or "to influence." The number of registrants will affect our decision of where to hold the conference. The dreary weather affects my mood. 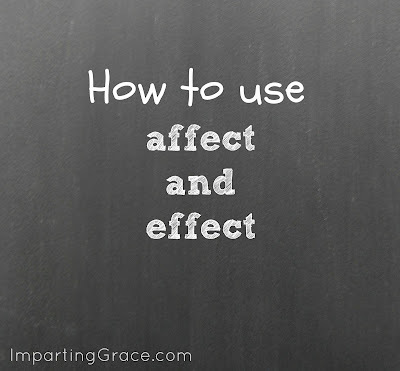 Effect is primarily used as a noun that means "something produced by a cause; a result." What will be the effect on conference location if we get more than 500 registrants? This dreary weather is having a bad effect on my mood. Remember: Affect is a Verb; Effect is a Noun. Those are the primary meanings of the words. If you can keep those squared away, you'll be doing great! As for the secondary meanings, the usage is reversed. Affect can be used as a noun. It's a term used in psychology and psychiatry regarding a feeling or an observed emotional response. Example: He presented with a flat affect, prompting his physician to suspect a mental illness. Effect can also be used as a verb, meaning "to bring about." Example: We are hoping the switch to computerization will effect real improvement in our record-keeping. Does that clear up the affect/effect question for you? If not, let me know in the Comments section and I'll take another stab at it. And as always, I ask you to please let me know if you have other grammar questions. I'd be happy to help you if I can! You can leave me a comment or email me at RichellaP (at) gmail (dot) com. can you help with "then" and "than." i suppose i could google it, but you teach so well. Nice post. 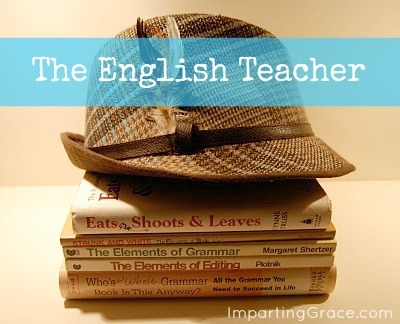 I like that you do these "English Teacher" posts. raven, raven, raven. i am going to remember this! Love this! I think I missed that day in school:) Love the blog! I just noticed that when I first wrote this post, I wrote "Effect can also be used as a noun" when I meant to write "Effect can also be used as a verb." Pretty bad when the English teacher doesn't catch her own mistakes! Oh, well. It happens. I'm a good editor, but I certainly don't catch every single mistake. This is a good lesson for me to remind me that the aim is NOT perfection but good communication! By the way, I went back and corrected the mistake in the post. Now it says what it's supposed to say (I hope!). I'm going to print this one off and study it. I love the grammar lessons!!! thank you. Thank you so much for the sweet comment you left today on my blog's birthday post. :) Made me smile. :) Did you get my email about Dinner?? I needed this lesson. I'm never sure when to use which one and now I know to use RAVEN! RAVEN? Oh wow! I've never heard that before. That's very helpful. I question myself on this one EVERY time I use these words and I'm never quite sure. This helps so much! By the way, I just want to let you know that I love the way you teach. Some people get really snotty and condescending when they correct grammar. I love that you don't do that. You're the great teacher/encourager, Richella. You make me feel a little less....dumb and not quite so ashamed of the dingy mistakes I make. Thank you for that! Such a nice lesson, and a good one at that! These two I rarely mess up on. My fourth grader is learning about this now. 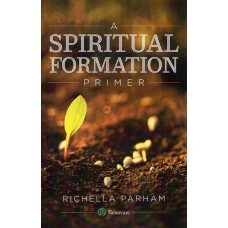 Hi Richella, I am really loving this series!!! I am sure I have used these words wrong many a times!!!! Have a great weekend! I was clear on the main usage, but it's that second bit I'm not sure I knew about! Thanks! What would the long-term effect be if you didn't have these lessons for us? Poor writing. Thank you for having a positive affect on us English writers and readers! Good lesson Richella but I think that is a hard one! I'm going to try to get it right because I don't like using the wrong word. I have trouble with apostrophe-s's. For example, is it "Chris' ball" or "Chris's ball"? Maybe this could be a future topic? I just think I'm always going to have a problem with this. RAVEN is easy enough to remember, but it's the secondary usage that's hard to grasp for me. What's so sad is that I'm an English major, but my school was horrible at keeping up with teaching grammar, because they were more focused on promoting reading, so I feel like I missed out on a lot of grammar rules. I actually bought an App for my iPod for grammar to help.